Campers should come to camp wearing an outfit that is suitable for outdoor exploration (we walk in high brush and forests), preferably not dresses/skirts/bare legs. A good pair of walking shoes and a pair of water shoes in their backpack. Water shoes cannot be flip flops and need to have a strap. Keens, tevas, chacos, old tennis shoes, aqua socks, are recommended. Bagged lunch, with an ice pack. Afternoon snacks should also be included if your child has food allergies or is picky. Otherwise, BookTrails provides a small afternoon snack. Note: Not all camps include a camp-out. Please see schedule to see if your child’s camp has a Thursday night camp-out at the ranch. In addition to the things that campers normally bring to day camp, please be sure to help your child pack the following items. We are able to provide sleeping bags if your child does not own one, just give us notice. Warm pants and sweatshirt, warm hat—it will get cold in N Routt! Students should pack a lunch for Thursday. We will provide Thursday dinner, Friday breakfast and snack. Please be sure to let us know of any food allergies prior to the camp-out. No additional food should be packed to prevent attracting animals into the camping area. One suitcase, duffel bag, or footlocker and a sleeping bag are sufficient for packing for a week or two of camp. Space is limited in the cabins, please do not over pack. CLEARLY MARK EVERYTHING WITH YOUR CAMPER’S NAME or INITIALS! We suggest that you send old clothes and linens with your camper. Some items may be lost or damaged. Please remember that we are in the heart of the Rocky Mountains and our weather can be unpredictable! Our temperatures usually reach 75 to 80 degrees in the daytime all summer and drop to 35- 48 at night in August. Our summers offer beautiful, sunny days with occasional afternoon showers and cool, crisp evenings and nights. This list has been created with your camper’s comfort and preparedness in mind. Those items listed as essential must be brought to camp. Do Not Bring These Items to Camp! We strive to offer children a unique outdoor experience. Please help support us in this mission by not allowing campers to bring cell phones, MP3 players, iPods, iPads or electronic games as they detract from the experience. We realize in this age of instant connectivity that it may be uncomfortable if your child does not have their cell phone with them. We ask that if you need to contact your child to please call the camp director and we will arrange for that conversation to take place. We strive to have the kids disconnect electronically so they can not only reconnect with nature but also with themselves. Our camp fees include all meals and daily snacks. Please do not send your child with food as it will attract animals to their belongings. 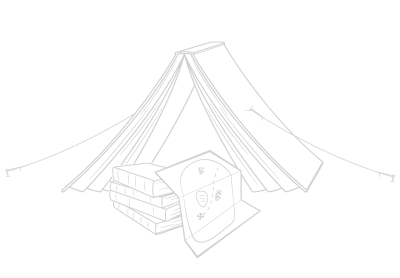 *Reading on Ranches Camp is not responsible for lost or damaged items. Sleeping bag (lightweight but warm with a rating of 15-20 degrees; filled with synthetic fibers or down, cotton is not advised. Pad is not necessary as campers will sleep on cots, but can be brought if preferred. Please pack a pillow. brings a camelbak, please also have them pack a regular bottle.